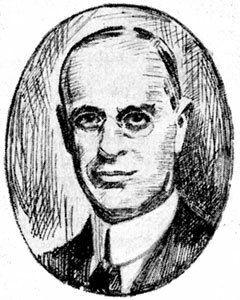 Charles Wales, a genius of mechanical motion and a native of Maryland, who lived in early 1900s in Detroit, filled his first patent application for adding machine in September, 1902, and when in 1903 the US patent No. 745539 was granted, he decided to establish a company to manufacture the device (Wales was a remarkable inventor, holder of 17 US and many foreign patents for calculating devices.) Thus the Wales Adding Machine Co. was founded in Detroit and soon began production of the remarkable series of adding-listing machines. In the beginning of 20th century, the adding machines of Wales Adding Machine Co., Wilkes-Barre, Pennsylvania (the company moved manufacture from Detroit to Pennsylvania in 1906), together with the Comptometer of Baldwin and Dalton of Hopkins, are a strong competitor of Burroughs. Actually Charles Wales soon left the company that bore his name to work for the Invention Department of Burroughs, and patented a visible printing mechanism used in their machines. 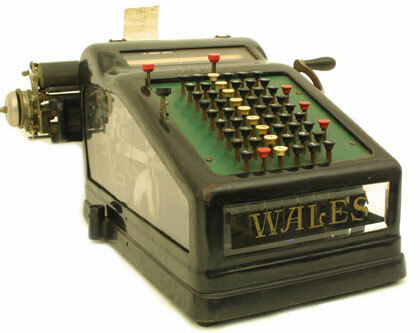 Wales later designed the White (known also as Federal), a cheap and beautiful adding machine, which was manufactured by the Colt Fire Arms Manufacturing Company of Hartford. 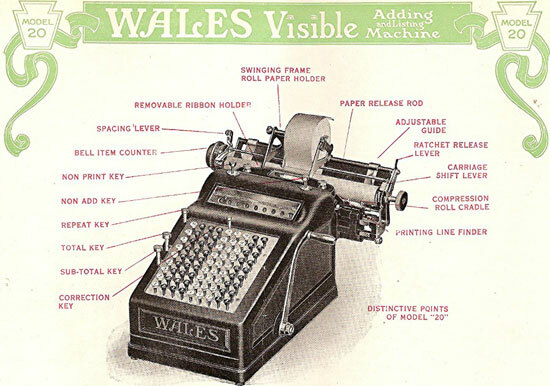 This success of the innovative Wales machines was due to the advanced construction, "visible" printing device above the keyboard and the variety of models, launched to the market. At one point, more than 40 different models of varying carriage width, number of places and auxiliary keys existed, but in 1923, the line was consolidated into two main classifications—the large machines, and the small portable models. The Wales Adding Machine is a full keyboard machine with integrated printer. It is a quite massive device, with dimensions 38 x 50 x 25 cm, and weight 29 kg. The first patent for the machine was granted in 1903. The advertising campaign started in 1908. The 1914 prices started at $175. The Wales machine was extremely popular in banks and other companies. In 1916 brochures are listed over 2000 banks using Wales machines and 54 companies (not all of them banks) that were using from 5 to 83 each. During 1920s the machine was sold successfully in two main varieties—large machines and portable models. All the models featured one or two calculating mechanisms. During the calculations, the operator first entered the number from the keyboard, then using the right lever the number is printed and added to the partial sum, and the keys are returned to the initial position. There are additional keys for special operations. The portable machines are a smaller variant of the bigger, featuring almost the same functionality.